for $480,000 with 3 bedrooms and 2 full baths, 1 half bath. 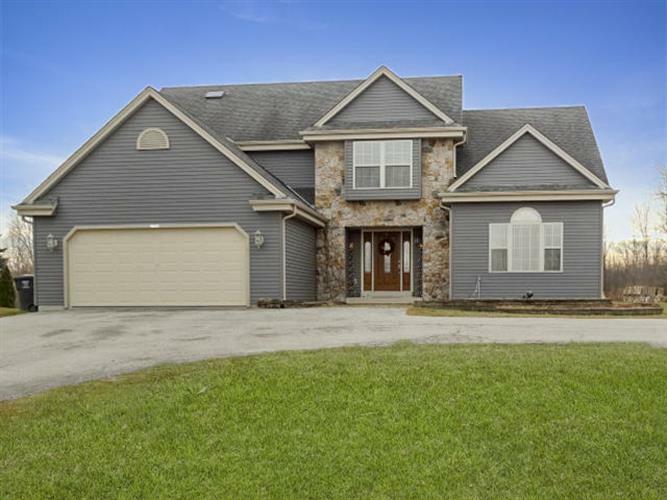 This 2,522 square foot home was built in 2003 on a lot size of 1.83 Acre(s). Executive home with Open Concept on 1.83 private acres! Only a relocation brings this home to market. Walk into a large Foyer with Formal Dining Room, soaring ceilings perfect gathering place for family and friends. Lots of light, large Great Room with plenty of light open to Kitchen and Upper level with newer HWF and upgraded carpet, newer professional grade SS high grade appliances, professionally painted with loads of cabinets, entertainment space.Master is large with En Suite with separate shower and tub. Upper level currently has office/den(might have possibility to convert to 4th BR check city).Basement has room to expand; studded and plumbed for bath and future use.Lot is large, heated workshop in back; equipped with many extras and lots of space/parking.